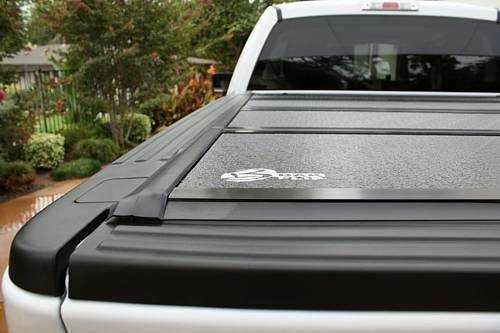 If you're in the market for a solid, robust, impact resistant, all season truck bed cover that performs as well as it looks, the BakFlip FiberMax hard folding tonneau is built for you. The BakFlip FiberMax is the perfect balance between the popular all aluminum BakFlip G2 and the Premier FRP composite BakFlip F1 tonneau cover. BAKFlip FiberMax includes all of the features of a standard aluminum BAKFlip, but with an FRP (Fiberglass Reinforced Polymer) surface, making the cover dent, scuff and ding resistant, as well as a high glass finish which is cooler to the touch. The FiberMax has a tough tough aluminum substructure, robust hinge design and patented slam latch system make the FiberMax an easy-to-use, dependable cover that is built to last. The FiberMax is widely available for most models of Chevy, GMC, Dodge, Ford, Honda, Nissan, Toyota, Mazda, Isuzu, Mitsubishi and VW pickup trucks. Feel free to browse through the BakFlip FiberMax products and select one that's right for you.